A couple of hours ago, we told you that Vodafone teamed up with Samsung to offer cashback of ₹1500 on select 4G smartphones. Well, Vodafone is not the only telecom operator that has partnered with Samsung. Telecom operator Airtel too has teamed up with this South Korean tech giant to offer cashback on select 4G smartphones and make them more affordable for the customers. 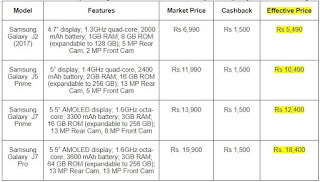 Airtel has partnered with Samsung to offer cashback of ₹1500 on four Samsung smartphones – the Samsung Galaxy J2 (2017), Galaxy J5 Prime, Galaxy J7 Prime, and, the Galaxy J7 Pro. 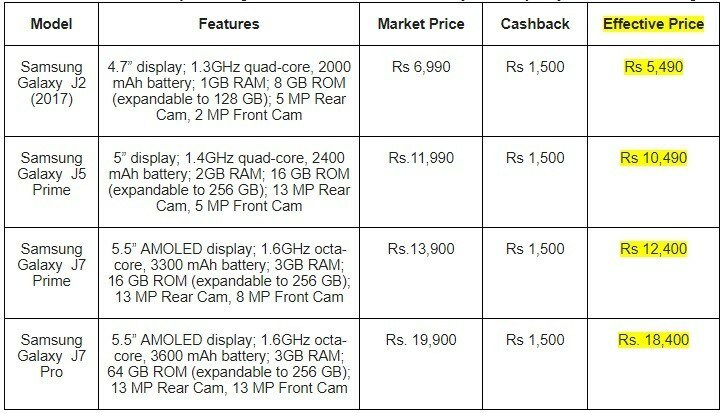 Well, with the cashback of ₹1500, the effective price of Galaxy J2 (2017), Galaxy J5 Prime, Galaxy J7 Prime and Galaxy J7 Pro comes down to ₹5490, ₹10,490, ₹12,400 and ₹18,400 respectively. All the aforementioned Samsung devices will come bundled with Airtel’s recharge pack of ₹199 which offers benefits like free voice calls and 1 GB data per day to the customers. That said, the cashback of ₹1500 will be given to the customers after 24 months. However, to avail this cashback benefit, Airtel customers will have to do recharges worth ₹2500 in the first 12 months that would entitle them to a cashback of ₹300, and, another set of recharges worth ₹2500 in next 12 months to get the remaining cashback of ₹1200. This offer will be available starting January 7 across the country, and, Airtel customers can do the recharge from any Airtel retailer.